This 6.1 mile segment along the Appalachian Trail was relatively short and easy – a perfect first hike after a long break from the woods. Although there aren’t any views or noteworthy stops along this section of trail, it’s a nice walk. Wookie and Adam make their way along the trail. We saw quite a few people along the segment of AT that makes up the Rip Rap circuit. 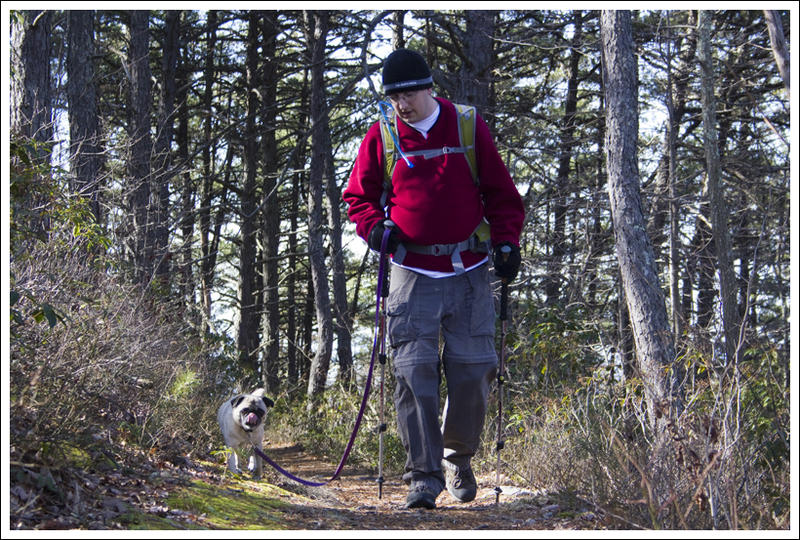 Hooray – our first ‘real’ hike since Thanksgiving Day. We decided to knock off another little section of the Appalachian Trail in Shenandoah National Park. It was a fun hike, but an uneventful one. Honestly, it really didn’t matter one way or another to me. The hiking wasn’t steep or challenging by any stretch of the imagination. Even though the hike was mostly uphill, it was gentle uphill. Wookie and Adam climb uphill. Below: Wookie is always very eager to get started; Adam checks out trail mileage at the junction of the AT and the Riprap trail. There really weren’t any views or distinct stops along this section of trail, but it was still good to be out and about. I will say, this section of trail is GORGEOUS in late spring when mountain laurel is in bloom. When we hiked Riprap a couple years ago, the section of AT joining the Rip Rap trail and Wildcat Ridge trail was abundantly in bloom. It was like a tunnel of flowers. So, if you want something to see – hike this trail section in May/June! Oddly, we didn’t see (or even hear) any wildlife the entire hike. Usually we see a deer or two, or at least hear a few birds singing in the trees. This hike was practically silent. The closest we came to wildlife was a ‘problem bear’ sign near the Wildcat Ridge trail junction. All in all, this was a pleasant outing with nothing special to report. Hopefully, we’ll be hitting the trails a bit more frequently as spring approaches. Well, it has been a while since we’ve been out on the trail. Actually, this has been the longest gap since we started this blog. It was great to get back on the trails again. 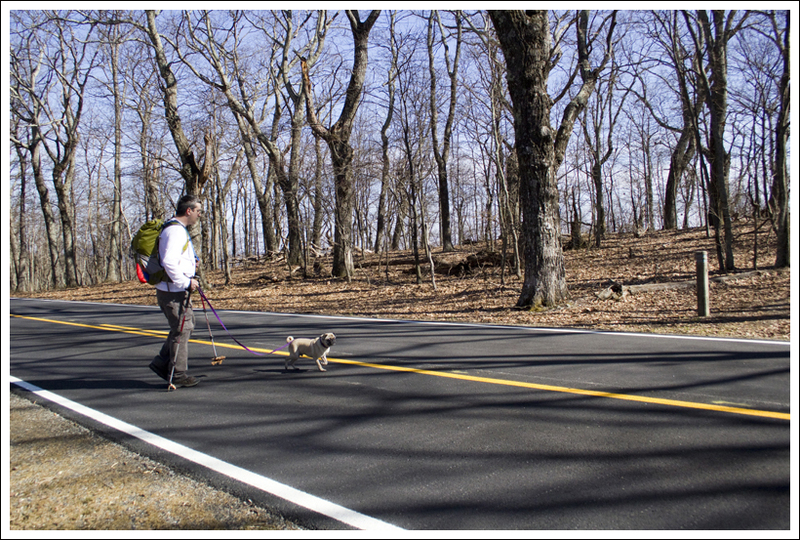 We decided to continue working on covering the Appalachian Trail through Shenandoah National Park. We bought a second park pass last year, so we could be able to cover this with some shuttles. Christine and I had talked about how we were going to cover the trail. We had some differing opinions on whether to do this northbound or southbound. I wanted to do the southbound way because I would prefer to not have an uphill climb at the end of the trail. However, going southbound ended up being uphill most of the way until the very end. There was one road crossing on this section of trail. Below: Problem bears! The white-blazed Appalachian Trail starts off uphill going about .7 miles and covering 300 feet of elevation until you reach the junction with the Riprap Trail. Stay on the AT and the trail does go back downhill for the next .5 mile until you reach the nearby Riprap parking lot. The trail continues a steady incline over the next few miles. If you hike during the winter you will have some obstructed views of the rocky ledge of Calvary Rocks to the east, but there aren’t any good overlooks on the trail. The trail then meets up with the Wildcat Ridge Trail at mile 4.2. Continue on the AT for a short incline. You will cross Skyline Drive around mile 4.4. The trail finally levels off and eventually leads downhill until you reach your second car at mile 6.1. Despite it being a little break since we had been hiking, we still felt like we were in decent enough shape to handle the hiking without much problem. We were surprised to run into several groups of people along this trail, but I think it is largely due to the access to the nearby Riprap and Wildcat Ridge Trails we have covered in the past. 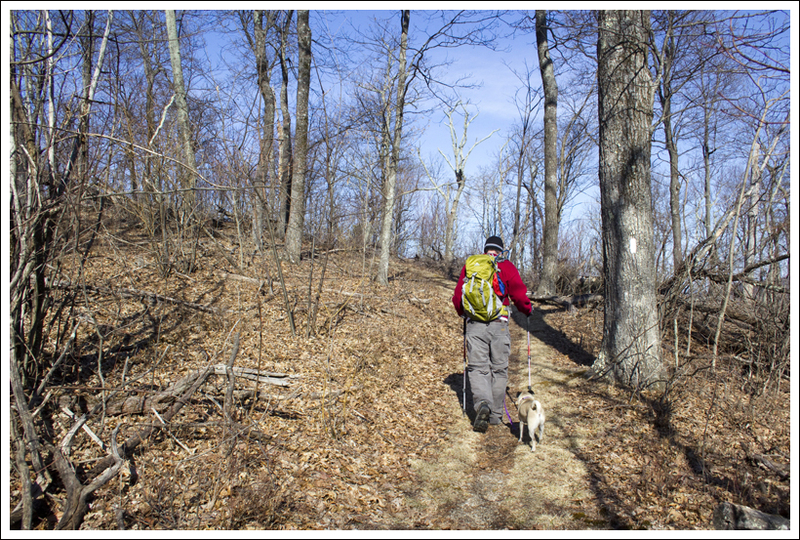 That set of trails are some of the best hiking in the southern section of Shenandoah National Park. It’s been a while since I’ve been hiking, too! What you might not know is that I had surgery shortly after my last hike. 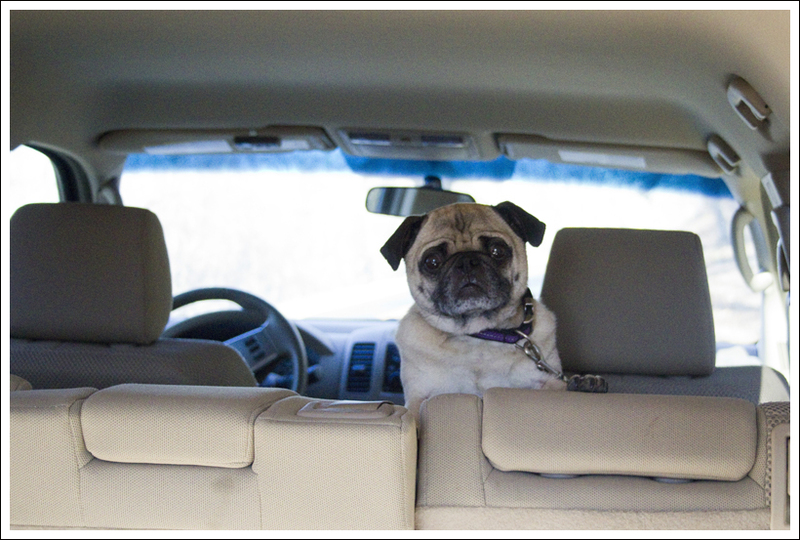 While I’m fit and trim for a pug, my soft palette had become thicker and longer in my middle years. Any time I became excited or exerted myself, I would faint. I don’t remember much – I would be happy and spinning around, then I would see stars and find myself lying on the ground wondering what the heck happened. My masters were very frightened for me and took me right into the vet. After a simple surgery and a month of recovery, I’m as good as new! This was a fun hike for me! I kept up pretty easily and even met several intimidating dogs along the way. I think they were friendly, but you can’t be too safe around strangers, so I mostly hid behind Christine. As a treat for doing so well on the hike, I got to eat two chicken nuggets when I got home! Difficulty – 2.5. The hike was fairly easy. If you would like less uphill walking, follow the trail northbound instead. Trail Conditions – 4. The trail was in great shape after our mild winter. Views – 0. Nothing to see here. Wildlife – 0. We barely even heard the chirp of a bird along this hike. 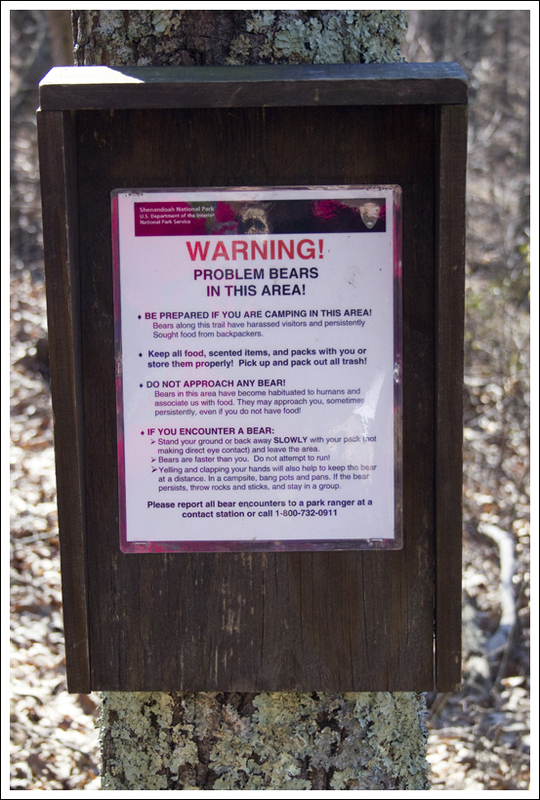 We did see a ‘problem bears’ sign near Rip Rap, but no sign of them. Ease to Navigate – 4.5. Just follow the white blazes and sign posts. The trail is very direct. 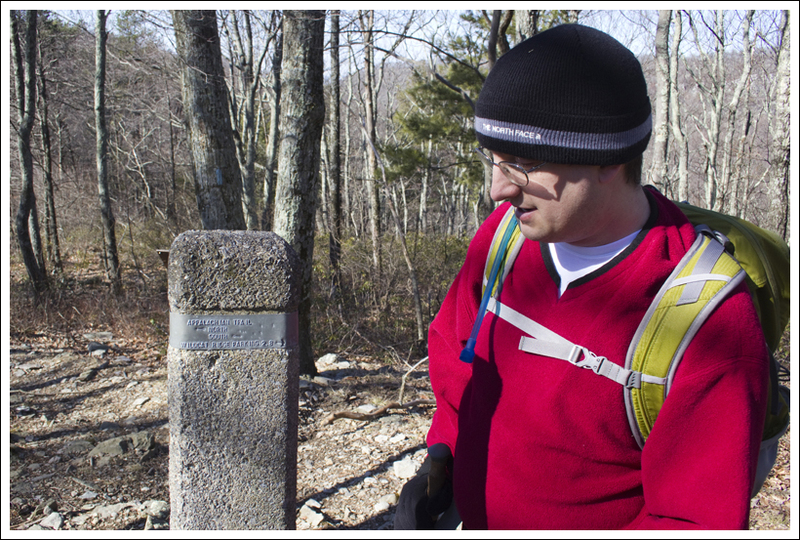 When crossing parking lots and the Skyline Drive, keep your eyes peeled for cement trail markers to continue your hike. Solitude – 2. This hike passes along a substantial section of trail used as part of the Rip Rap circuit, so expect to see plenty of people. Have you ever done the Riprap circuit, Bennington? It uses about a 3 mile section of this stretch of AT. It has been a while, but I have done the Riprap circuit. I need to get back because I hiked them in my pre-GPS days and want to get the data, and I think there is an Earthcache on the loop that I could pick up. That circuit is a favorite for the PATC’s Charlottesville Chapter (http://patc-charlottesville.blogspot.com/p/hike-schedule.html) and the PATC’s Southern Shenandoah Chapter (http://www.ssvc.org/). I remember it being a little easier than the Trayfoot Mountain/Paine Run loop a little further north. Nice write up! I did this section many years ago and haven’t had any desire to return as it doesn’t easily fit into any loop hikes. On Sunday I did the next section south as part of an 11 mile loop coming up from the Sugar Hollow Reservoir. I think you will find that section a little more interesting, if you haven’t already done it. Saw 3 deer right at Turk Gap and was glad I had my dog leashed! Hope to read more posts in the near future. Wookie, I am glad you are feeling better, and I know your people are glad too. Wookie thanks you for the well wishes, Les!